CHICAGO (WLS) -- Police are asking for the public's help to find a 13-year-old girl missing from Chicago's Humboldt Park neighborhood. Deonna Smooth, 13, was reported missing from the 4300-block of West Thomas Street. She was last seen around 5 p.m. Sunday. Police said she frequents the 4300-block of West Crystal Street. Deonna is 5 ft. 6 in. tall and weighs around 110 lbs. She has a medium complexion, long brown hair and brown eyes. She was last seen wearing a black and white "Pelle Pelle" jacket with white lettering, black and gray jeans and gym shoes that are black, purple and white. She also painted her nails green. 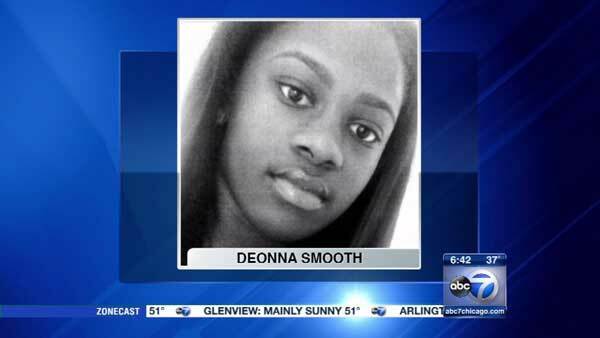 Anyone with information regarding Deonna Smooth's whereabouts should contact Area North SVU at (312) 744-8266.